Being prepared for an emergency is one of the most important things you can do. We don’t want to ever think about something happening, but if we are ready, it takes a lot of the stress away. Although we are having a very mild Winter here in Indiana, there have been times we had over 2 foot of snow at once. 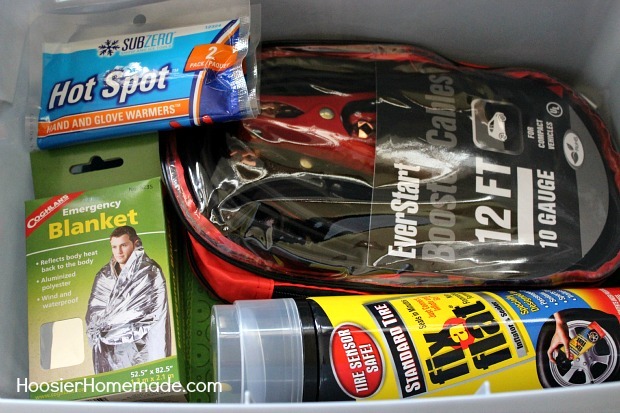 With all the traveling we do, and I’m sure you do as well, it’s a good idea to put together a Winter Emergency Car Kit. 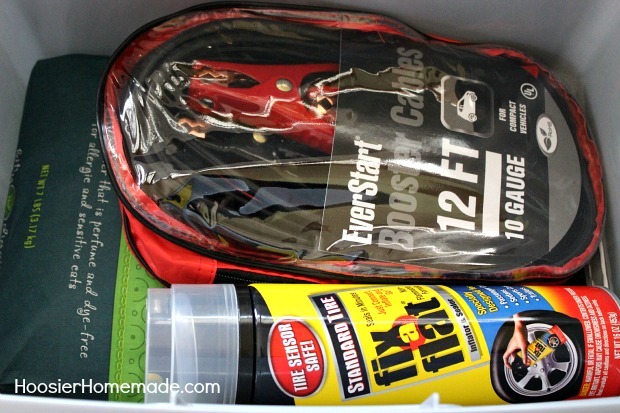 If you are lucky enough to live somewhere that doesn’t get snow, many of these items are great to have in your car. 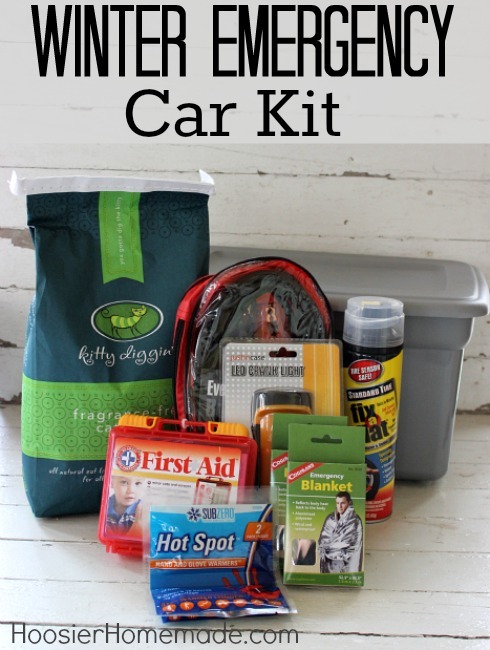 The Emergency Car Kit is simple yet filled with some items you may not have thought about. We found everything we needed at Walmart. 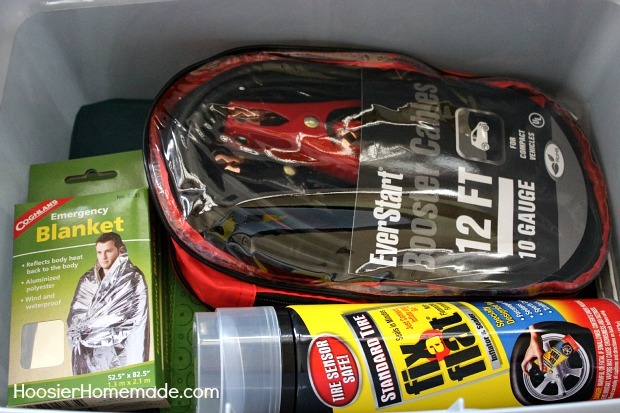 Start by finding the things you need for the Car Kit, then find a plastic container that will fit them snuggly. 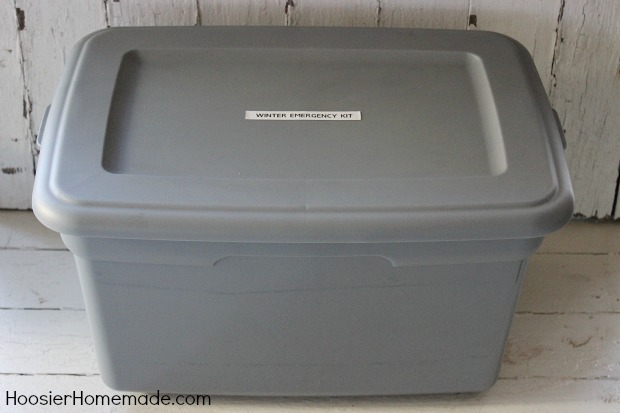 The container should be as compact as possible so it doesn’t take up much room in your car. 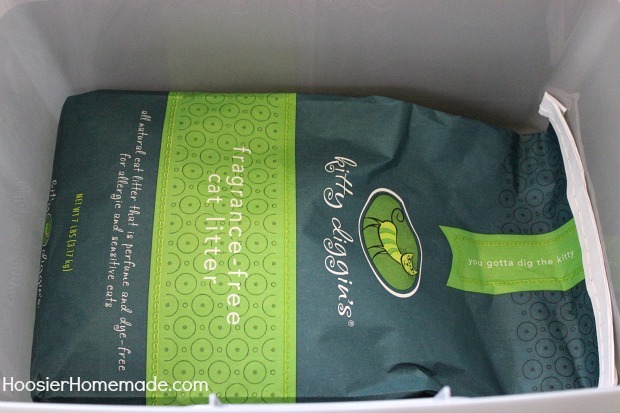 The first item we added to the container is non-clumping Kitty Litter, just a small 7 pound bag works fine and it was less than $1. Kitty Litter is perfect for throwing under your tires if you are stuck in snow or on ice, it will give you traction. 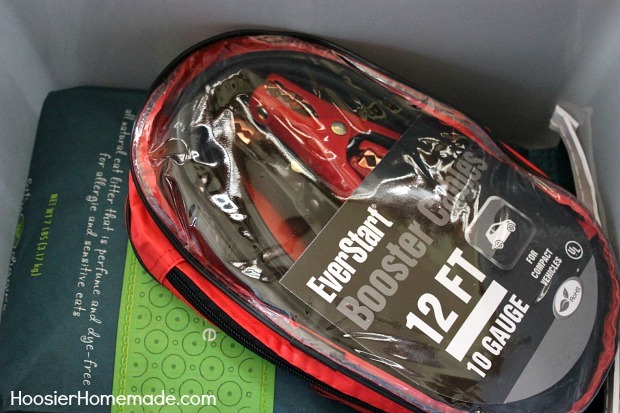 Next are the Booster Cables, which every car should have regardless if it’s Winter time or not. We found these for less than $10. Then we added a can of Fix-a-Flat. While this obliviously is not a permanent fix, it could get you by in an emergency. The heated emergency blanket might have been one of those items you weren’t aware of. I didn’t know they were available until Doug suggested it. We found the blanket in the camping section at Walmart. Next are the Hand Warmers…these my friends, are the best ever! We used them while sitting through cold football and baseball games last year. And are a perfect addition to your Emergency Car Kit. 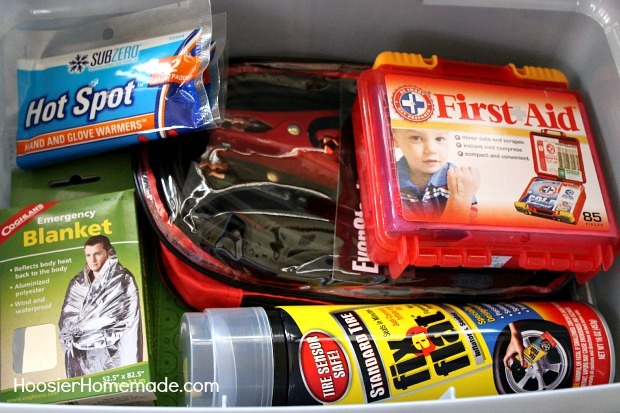 Once again, even if it’s not Winter time, a First Aid Kit is a must in every vehicle. We found this one near the Pharmacy, and it’s packed with products. Finishing off our Winter Emergency Car Kit is quite possibly the coolest item yet, a light, but this is not your ordinary flashlight. This is a LED flashlight and it doesn’t need batteries, you just crank the handle to generate power. It also has a steady light and a flashing light for emergencies. And there you have it…a little piece of mind that took about 30 minutes of your time to shop for and assemble and about $40 worth of products. Be sure all the packaging it removed before you place your items in the kit. Nothing would be worse than needing a bandaid and not having scissors available to cut off the zip tie that was holding it closed. These Car Care Tips are great to read through and make note of. Another good idea for a container is a backpack or bag with a handle in case you need to carry your supplies with you. 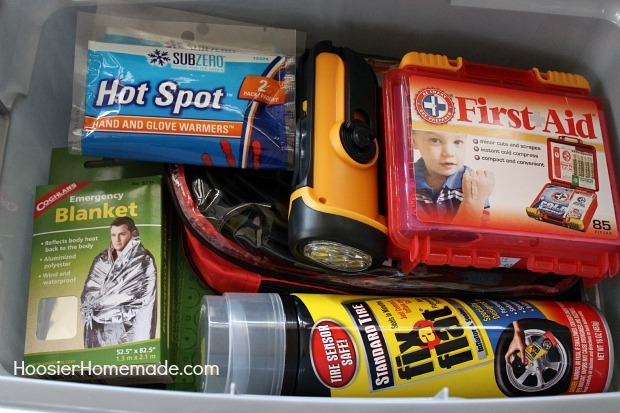 So if you don’t have an Emergency Car Kit, put it on your to-do list for this weekend. You will be glad you did! I take old pill bottles and fill them with cotton balls or make-up remover pads that have been dipped in melted candle wax. Good for starting a fire. After reading many Winter Kit suggestions, I noticed that there are some things missing, and some things I wouldn’t do. First of all, I grew up in Winnipeg Manitoba. Let me tell you, it gets very, very cold there. I know some folks will have negative comments, but I’m talking from 16yrs military experience here. 1- if you get stranded, stuck, check on how much fuel you have. You have to think ahead and say to yourself, I might be here for a couple of hours to 24hrs. If you don’t have much fuel left, you wont want to use it all. 2- how far are you from you destination? Am I closer to where I came from, or closer to where I’m going? Can I walk without getting lost and or cold. 3- in your kit, you should have a old coffee tin. Not a big one, just the medium size will do. Have a couple of candles, (or make your own in a old cough candy tin) You can also have a soup tin inside the coffee tin to hold the candle. It will give off twice as much heat. If there’s 2 of you, put the candle on the consol. But make sure you put a approx. 6″X6″ of wood so it does burn a hole. 4- Take some broth, or tea (green tea) or soup that just uses water. (that’s what the coffee tin is for) You need the warm liquid. It will also give you energy. 5- get some reflective tape, and/or a reflective flag and put it on your antenna. You can write HELP on it. You can pack these things all into the coffee tin. Me personally, I wouldn’t use any of the plug-ins for heating anything up. You will be using up the battery and fuel. Or just the battery. The only reason why you should use it, is to charge up your phone. If you live in the winter areas, wrap your battery up. You can buy a battery blanket ant almost any store. Or even better, get some firs retardant insulation and wrap it. It will hold the heat in even better. I could go on and on, but everyone here gets the jist of it. Stay safe, don’t panic. Help is always there if you use you head. All of these suggestions are great! Please include something to occupy your time while waiting for relief from the weather or help. eg. A good book, games, etc. Boredom is a b*tch. I’m giving this as a gift to my college freshman who is a three hour drive from home. It’s also a gift of peace of mind for his mom. Thank you so much for suggesting this. I pinned it! This is my goal for this weekend except I’m swiping out the jumper cables with a portable charged jump box! Thanks Vern, the portable charged jump box is a great idea. I keep one of those in the toolbox of my truck. Just make sure you check it and charge it at least every few months. This is great! I also liked all of Melissa’s suggestions. We also have a roll of toilet paper, coloring books/crayons, a dark towel, and a small Teddy Bear. Thanks for stopping by Danielle! Even though I no longer live in the NW Suburbs of Chicago or in the Ozarks this sounds like a wonderful idea as we still sometimes get snow and ice in the plains of Texas in the winter time. Thanks for the great ideas. Lock de icer In your purse not the car! Antifreeze, break fluid, oil, tire pressure gauge, tire iron & an air compressor. I could go on and on honestly but these are what I would suggest adding. This is a great idea. Especially for people who live in “cold” country. You must be an extremely organized mom. Thanks Linda! It’s always a great feeling when things are organized.